This chapter reviews fundamentals of e-supply chain management and examines the transformation from the traditional supply chains to the e-supply chains (e-SC). This chapter applies experience management (EM) and experience-based reasoning (EBR) to intellegent agents in the e-SC and explores how to use experience in extablishing trust in other agents. The role of trust and deception in supply chains for real-time enterprises is discussed, and a logical framework for fraud and deception is explained in this chapter. EBR is considered as a way to manage trust in the supply network. This chapter explores cooperation and negotiation, trust and deception in e-supply chains by providing methodologies and intelligent techniques for multiagent trust, negotiation, and deception in an e-SC. Finally, a unified model is developed for integrating cooperation and negotiation, trust and deception in e-supply chains. 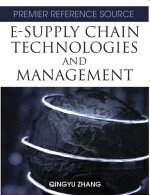 Although primarily theoretical, the chapter highlights new areas of research which will impact supply chain management.